The Latin Mass (or Tridentine Mass) is the form of the Roman Rite Mass contained in the Roman Missal that were published from 1570 to 1962. It was the most widely celebrated Mass liturgy in the world until the introduction of the Mass of Paul VI in December 1969. The term “Tridentine” is derived from the Latin word Tridentinus, which means “related to the city of Tridentum”, or the modern-day city of Trent, Italy. It was in response to a decision of the Council of Trent that Pope Pius V promulgated the 1570 Roman Missal, making it mandatory throughout the Western Church, excepting those regions and religious orders whose existing missals dated from before 1370. In 2007, Pope Benedict XVI issued a motu proprio entitled Summorum Pontificum. 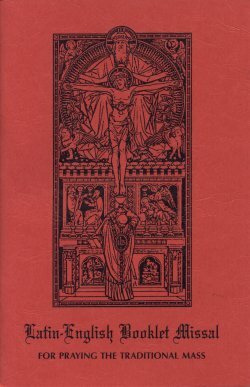 Within it, the Pope stated that the 1962 edition of the Roman Missal is to be considered as an “extraordinary form” (forma extraordinaria) of the Roman Rite, and that the Missal as revised by Pope Paul VI in 1970 is the “ordinary, normal or standard” form. What Is Different About The Extraordinary Form Mass & The Ordinary Mass? As it’s name implies, the majority of the Mass is said in the Church’s universal language of Latin. The only exceptions of this are the readings & Gospel (though they are also said in Latin & sometimes the local language is not used, generally if there is a time constraint), and the homily. If you don’t know Latin, that’s okay! Most churches supply red or white Latin to English Missals with very easy to follow instructions (text and illustration) in the columns to help guide you through. Before you know it, you’ll be singing the Gloria along with everyone else! What is High Mass & Low Mass? There are two types of Extraordinary Form Masses – the Low Mass is the first Mass of the day if both are offered. The Low Mass is very quiet and solemn, with little to no singing, and the priest offering the Mass speaks most of the prayers inaudibly & the Asperges is omitted at the beginning of Mass. It is custom that after a Low Mass, the priest and congregation pray for the intentions of the Holy Father (The Leonine Prayers) by saying one Our Father, Three Hail Mary’s & One Gloria, in addition to the exorcism prayer to St. Michael the Archangel & Hail, Holy Queen. High Mass is also called “the sung” Mass, and as it’s name implies, there is a lot of singing by the choir, the congregation & the priest. The prayers said by the priest during the Sacrifice of the Mass are generally a bit more audible than during Low Mass. There are also different times to stand, sit and kneel between the two types of Mass. If you’re using one of the red booklets, there will be indicators in bold (STAND, KNEEL, SIT) in the column to indicate when to do what. Don’t know when to sing? Take cues from your choir. As a general rule, if you hear only one singer in the choir chanting, it is meant to be a solo. If the rest of the choir is singing, it’s a cue for the congregation to join in. If you’re new to the Latin Mass, you’ll notice that many, if not all, women attending will be wearing some kind of head covering. Traditionally they are called “mantilla’s”, but not all women wear the veil. Some opt for long scarves or even hats. Veiling is a tradition based on the writings from St. Paul (“That is why a woman ought to have a veil on her head, because of the angels” 1 Cor: 11,10 and the context of that passage is reverence during worship) and analysis through Pontifical letters over the centuries. Receiving Holy Communion in the Latin Mass is done kneeling, with the communicant receiving on the tongue only. The communicant does not say “Amen” after receiving & blesses one’s self upon departure from the Communion rail. Please note that only baptized Catholics in the state of grace (you are free of mortal sins) may receive Holy Communion. -The “Asperges” is an optional penitential rite that generally precedes the Mass. Between Easter and Pentacost, the hymn changes to “Vidi Aquam”. -Psalm 42 (“Iudica me, Deus”), preceded and followed by the antiphon “Introibo ad altare Dei, ad Deum qui lætificat”. -Dominus vobiscum (“The Lord be with you”) before the Collect. -Gloria in excelsis Deo (The Gloria is omitted during liturgical seasons calling for penitence, such as Advent and Lent, both generally having the liturgical color violet, but is used on feasts falling during such seasons, as well as on Holy Thursday. It is always omitted for a Requiem Mass). (The priest reads the Epistle, primarily an extract from the letters of St. Paul to various churches. In his motu proprio Summorum Pontificum, Pope Benedict XVI has permitted this to be read in the vernacular language when Mass is celebrated with the people. Between the Epistle and the Gospel two (rarely three) choir responses are sung or said). -The Gradual (partly composed of a portion of a Psalm). -Offertory Verse (High Mass Only: the priest blesses the incense, then incenses the bread and wine. The priest then gives the thurible to the deacon, who incenses the priest, then the other ministers and the congregation). -The Lord’s Prayer and Libera nos (During a High Mass, the priest sings the entire prayer alone, and the faithful respond with the last line of the prayer, “Sed libera nos a malo”). Is the English/Latin missal available online for download? Hi Jaki, you can download the pdf here http://www.allsaintsrichford.org/Latin-English%20Missal.pdf or if you have the Laudate App, you can have the entire mass loaded to your phone. God bless!